Description: Basic pullover woman raglan sweater in stockinette stitch with 2x2 ribbing along neck, sleeve and lower body edges. I knitted ribbing in this pattern not so tight because I wanted it to be loose and straight. If you like ribbing that hugs to your body, you can knit 90% less number of stitches than the body. I could have just skip the ribbing part and do a few rows of garter st instead. 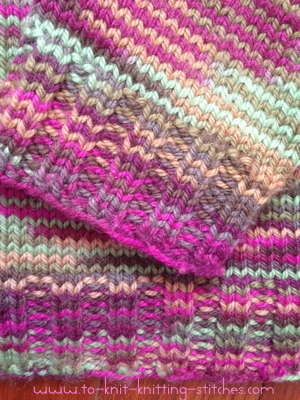 But I like the ribbing look and I had to include it here in this pattern. 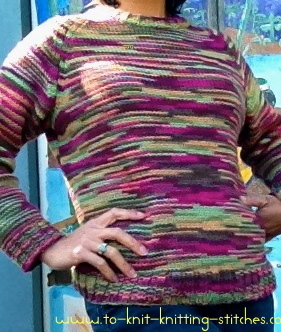 I used 100% pure new wool by Patons for this raglan sweater. It’s a medium weight (#4) yarn and it really keeps me warm in the morning during when I go out and walk my dog. I’ve been wearing it almost everyday since I finished it last week! It a perfect time to have a warm wool to wear. I just love the colors and the feel of it. 1. Approximately 1033 ( 1186, 1347 ) yards of Medium worsted weigh wool or yarn of your choice. Note: The 1st numbers before parentheses refers to smallest size (34) and the two numbers in parentheses refer to the larger and the largest size (38 and 42) respectively. It’s a good idea to circle all those numbers that belong to your size to minimize confusion. Row 1(right side): K1, P2 *K2 , P2. Repeat from *. End K1. Row 2 (wrong side): K the k sts and p the p sts. Repeat row 1 and 2 . Work ribbing for 2 (2.5, 2.5) inches. ending with the right side row. With larger needle, work in stockinette stitch (k on right side and p on wrong side) until piece measures 14 (15, 15.5) inches. Note: When decreasing, I like to do it on the 3rd st instead of the first stitch because it looks better when putting the seams together. I do this by k 2, ssk, k to last 4 sts, k2tog, k2. Bind off 10 sts each side. Decrease 1 st each side, every 2nd row 24 (27, 33 ) times. Decrease 1 st each side, every 4th row 2 (2, 0 ) times. Bind off rem 26 (30, 32) sts. Work to center 10 (14, 16) sts, attach another ball of yarn, bind off center 10 (14,16)sts, complete row. Work both sides at once. Bind off 2 sts at each neck edge 2 (2, 2)times. Dec 1 st at each neck edge, every other row 4 (4, 4) times. End off. (cut yarn and pull it through the last stitch to secure). With smaller needles, cast on 42 (46, 50) sts. Work same as body rib for 2 ( 2.5, 2.5 ) inches ending with the right side row. Increase 0 (2, 0) sts evenly on the next row. Increase 1 st on each side every 4th row 1,(0, 2) times. Inc 1 st on each side every 6th row 14 (12, 14) times, then every 8th row 0 (2, 0) times. Continue in stockinette st. until piece measures 17 (17.5, 18 ) inches. dec 1 st each side every 2nd rw 16 (18, 21) times. Dec 1 st each side every 4th rw 6 (6, 6 ) times. Bind off 6 (6, 6 ) sts. 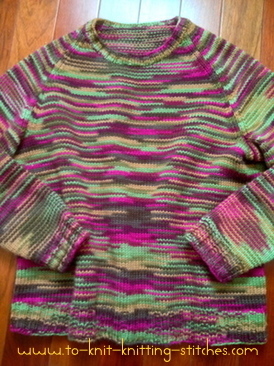 With right sides together, seam sleeves to yoke. Seam sleeves and sides. Weave in all end. edge. Increase or decrease as necessary on the first row to balance pattern. Work in rib pattern for 1" or desired length. Bind off loosely. If you prefer rolled neck edge, knit all row until desire length. Click Here to Download Woman Raglan Sweater in PDF. stockinette st = knit on right side and purl on wrong side. ssk = slip slip knit (slip next 2 sts knitwise and one at the time, then insert left hand needle through the front loops of both sts and knit with the right hand needle. The end result is a left slanted decrease st.